Jessica Turkish, J.D., M.A. is a partner at Nyman Turkish PC and specializes in our Social Security Disability practice. With a professional background in clinical psychology, Jessica possesses a unique skill set that makes her an ideal disability advocate. Jessica strikes a necessary balance between empathetic counselor and aggressive attorney. While Jessica excels in all disability matters, her expertise lies in cases involving psychological diagnoses, such as Bi-Polar, Depression, and Anxiety Disorders. 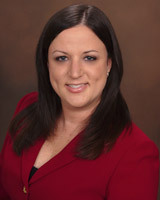 Jessica is acutely aware that too many other disability law firms handle cases in an impersonal manner, with it not being uncommon for a first contact between client and attorney to occur at Hearing, months or even years after the lawyer retains the client. Jessica finds such behavior (or shall we say “lack thereof”) unacceptable. Jessica’s philosophy is to afford each of her clients the time they deserve. She’s always approachable and strongly believes in educating her clients about the law from initial contact in a way that makes her clients feel informed, empowered, and equipped to be an active participant in the Social Security Disability claims process. Jessica fights hard and diligently. She promises to do everything in her power to get her clients the benefits they deserve.